The Le Sigh: Premiere: Hand Grenade Job - "New Year"
Premiere: Hand Grenade Job - "New Year"
Check out the meditative new video from D.C.'s Hand Grenade Job. After the election, it was easy to think of January 20th as a day in the far away future. But as the upcoming inauguration draws closer, it's difficult to not feel extremely bleak about what's to come. How are we supposed to feel optimistic when every piece of news is telling us otherwise? D.C. duo Hand Grenade Job isn't ignoring the facts, but they're here to offer a bit of salvation. Members Beck Levy and Erin McCarley have been quiet mainstays of the capital's music scene, playing in both a handful of other DIY D.C. bands. They've been playing as part-band-part-performative-art-project Hand Grenade Job since 2012, which was also the last year the released an official album. This will change next month when they release their LP Devotionals with Sister Polygon Records. Devotionals was recorded in a rural Maryland cabin in the winter, which you can hear laced through their sparse song "New Year." 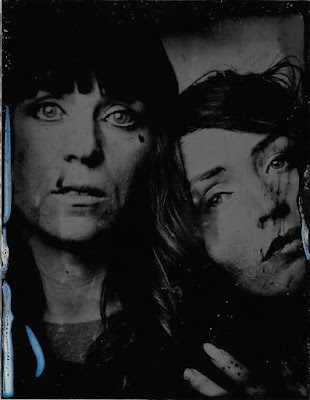 On "New Year," Levy and McCarley meditate on the changing world over hypnotizing sleigh bells and their beautifully harmonizing voices. In the music video, they embrace a youthful spirit as they work on a massive mural while children color on their faces. They channel this pure energy to prepare them for the upcoming uphill battle. It's no use wallowing in the state of the world if we don't try to fight back, even if we do it quietly. Watch the video and read some words on song from the band below. "'New Year' is Hand Grenade Job's second video off their upcoming album Devotionals, out February 24th on Sister Polygon Records. In the video, our two exhausted heroines embody the life hangover we feel from 2016. Will the future be different than the past? It has to be. Children deserve better. Progress feels like an illusion, but time isn't linear either. Here, moments of joy and youthful exuberance triumph. As the video closes, Hand Grenade Job don children's warpaint together, bitterly resolved to face whatever is to come." Listen to Hand Grenade Job on bandcamp.